A garden plant that can escape into the wild. Here in a garden. Up to 50cm high. 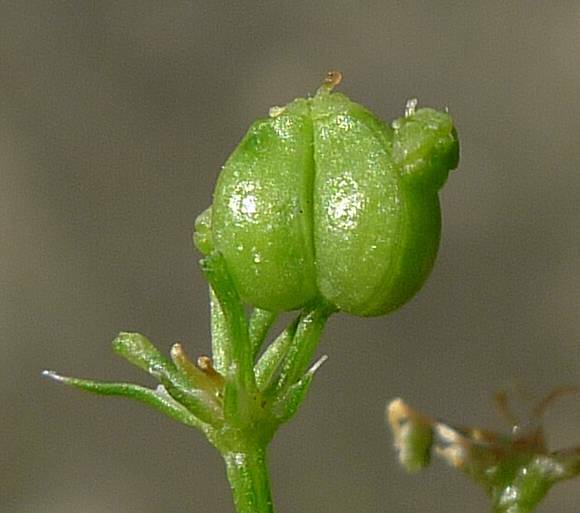 The single umbel at the continuation of the main stem seems to flower first and turn to seed (fruit) before the peripheral unbels have even opened their flowers. Umbel of umbel with flowers still to open (left) and umbel of umbels with flowers turned to fruit (right). Stem leaves are thin and narrow like pine needles, but branched; very different from the curly leaves eaten as salad nearer the foot of the plant. 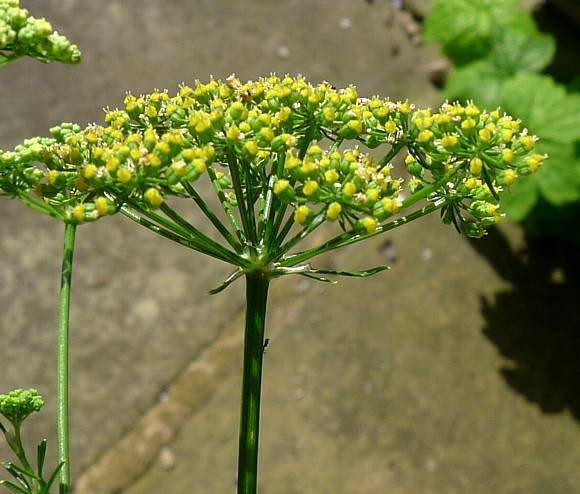 Compound umbel of flowers gone to fruit, the tops are bright yellow. Umbel of double-barrelled fruits with two yellow blobs atop and the remains of the style with two short prongs protruding. The fruits. The fawn-coloured tissues are the remains of the petals, most have dropped off. Un-opened flowers are pale green, and curled up like PP9 battery terminals. The five pale green petals have not un-furled yet, when they become whitish to transparent. 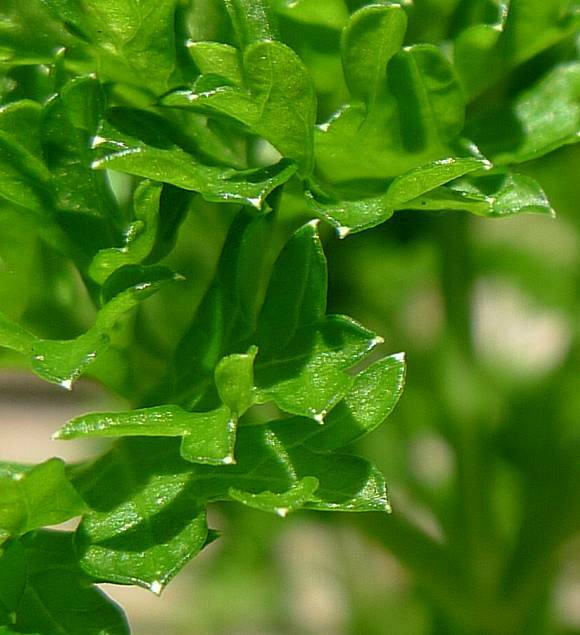 The curly ('crispy') lower leaves of Parsley, those which are eaten as a salad. Yellowing leaves are suffering from chlorosis , where they produce insufficient chlorophyll typically caused by insufficient nutrients or water-logging of roots. This last summer has been the wettest since records began 100 years ago. The leaves are pinnate, but so compacted and curled up that it is difficult to see what's what. The edible leaves in close-up. The tiny double-barrelled fruit, about 2mm across, singled out for clarity. Not to be semantically confused with : Cow Parsley Anthriscus sylvestris, Upright Hedge-Parsley Torllis japonica, Spreading Hedge-Parsley Torilis arvensis, Fools Parsley Aethusa cynapium, Milk-parsley Thyselium palustre, Cambridge Milk-parsley Selinum carvifolia [all of which are members of the same Carrot Family as is Garden Parsley, but which may be in-edible or toxic]. Nor should it be semantically confused with : Parsnip [a cultivated plant with edible tuber and similar name belonging to the same family]. Nor with Wild Parsnip (Pastinaca sativa), a similar plant. The inflated rootstock of Garden Parsley looks similar to the root-stocks of both of these plants, the Parsnip, but is smaller. The two taste very different, but the 'Hamburg' variety is often grown for the root vegetable, although it is not eaten in the UK. Nor with Great Water-Parsnip (Sium latifolium) or Lesser Water-Parsnip (Berula erecta). [These too are members of the same Carrot Family as is Garden Parsley, but which may be in-edible or toxic]. 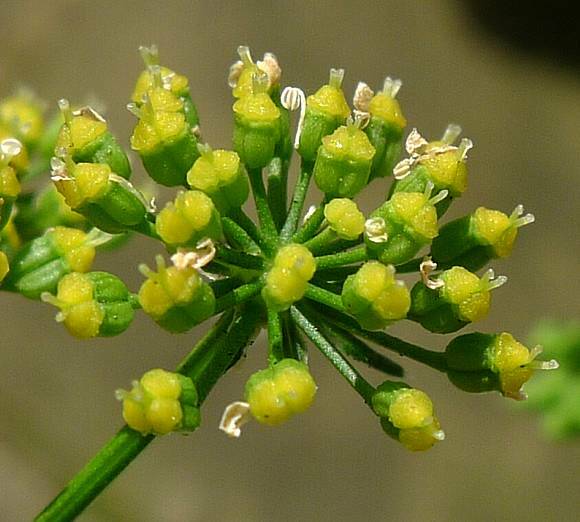 Easily mistaken for : Fools Parsley Aethusa cynapium which belongs to a differing Genus and un-like Garden Parsley has 3 to 4 thin long upper bracts hanging down underneath each small sub-umbel. Leaves are similar and pinnate, but are mostly planar and less curled/crisped. 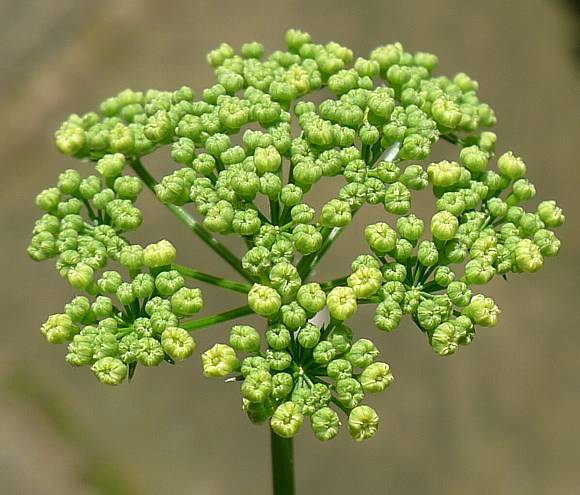 The Genus Petroselinum derives from the Greek πετρα (petra) meaning stone or rock and σελινον (selinon) the latin name for Celery (which is Apium graveolens, not Petroselinum graveolens). 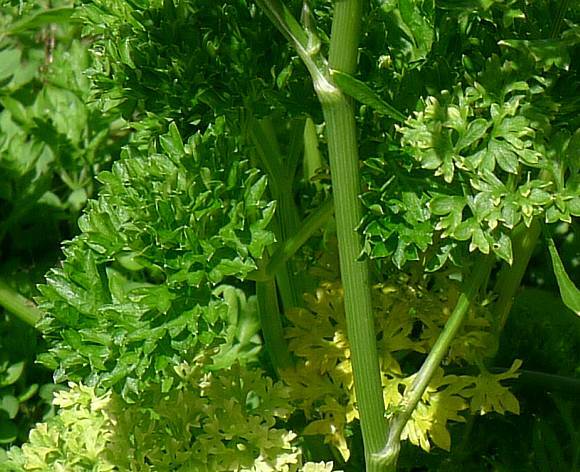 Why parsley seems to be confused with Celery is unclear, except that both are Umbellifers. In particular, it has nothing to do with petrol, selenium or the Moon. There are 37 varieties or Cultivars of Parsley, reportedly the most valuable of which is 'Curled Leaf'. When crushed Parsley has a pleasant odour due to the essential oils that it contains. The above photographs show the 'Triple Curly' variety. There are many other varieties, but the 'Italian' variety has much flatter leaves but has the better flavour. There are also 'German' and 'French' varieties. 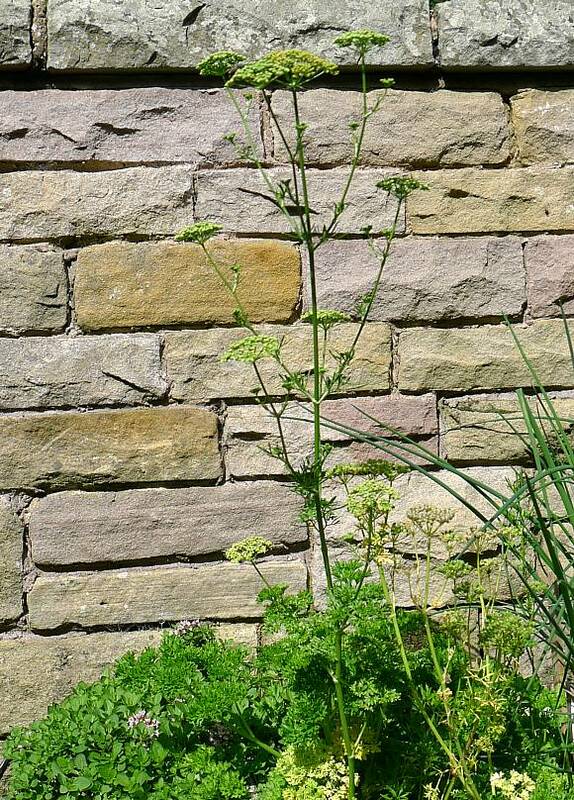 The flat leaf varieties more closely resemble the wild variety of Garden Parsley. The proportion of Apiole to Myristicin varies between varieties, as well as the total toxin content. 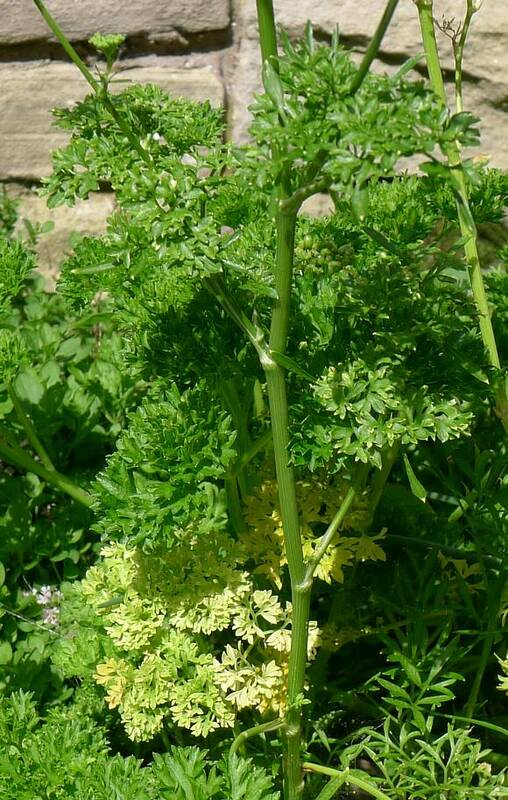 One of the toxins within Garden Parsley is the FuroCoumarin OxyPeucadanin Hydrate . 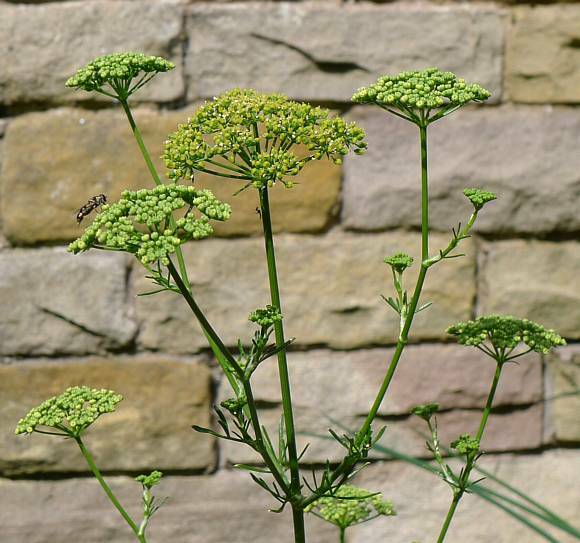 Garden Parsley is a biennial herb often grown as an annual. It is eaten as a side-salad or garnish to a main meal. It is toxic to various degrees, depending on the concentration of two toxins that are present in it, the toxicity varying considerably between variety. The essential oil contains both Apiole and Myristicin, the latter being the poisonous principle first found in Nutmeg. Apiol is also known as Parsley Apiol. 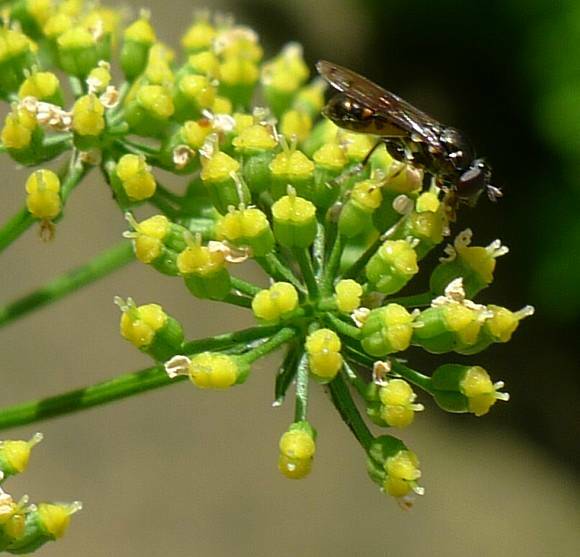 Both are toxic and uterine stimulants, accounting for the use of the volatile oil of Parsley as an emmenagogue and its abuse as an abortifacient. It reinstates the menstrual cycle. 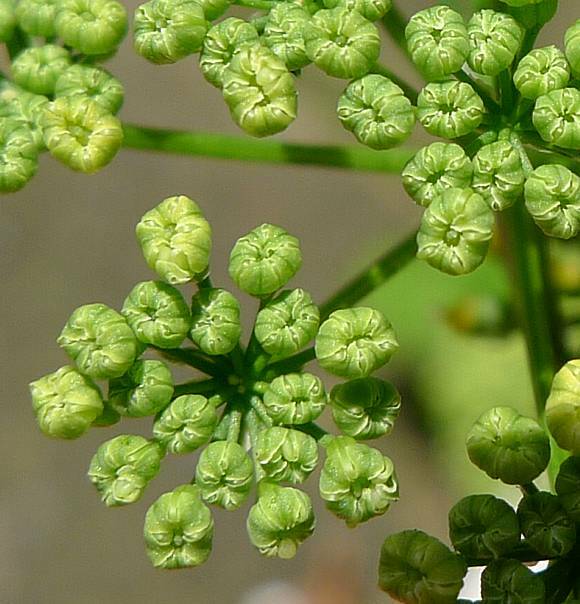 Apiole (also known as Parsley Camphor) in particular has a desirable parsley aroma. It is also found in Celery . Parsley is also used as an aid to digestion and as a diuretic. The volatile oil concentration is lowest in the roots at 0.1%, three times higher in the leaves, and between 2% to 7% in the fruits. 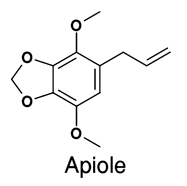 Both Apiol and Myristicin are similar both chemically and in their physiological action; both are toxic and in high doses can damage the liver and kidneys. A lot of parsley would have to be eaten before any toxic effects are noticed, which is why it is only eaten as a garnish rather than as a vegetable, and even then, it is seldom eaten, just used to brighten up the plate. The fruits should not be eaten, as they contain much higher concentrations of toxins. Pregnant women should refrain from eating parsley. the essential oil is used in cosmetics, hair shampoos, perfumes, skin lotions and soaps. 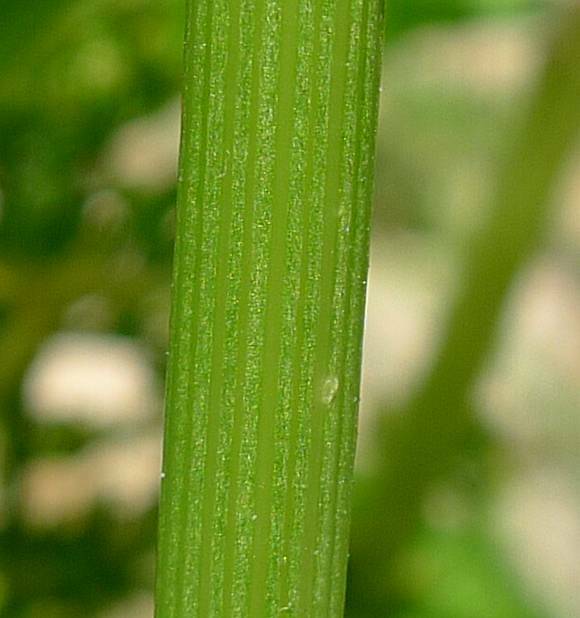 Apiol is related to Dillapiole which is found in Dill and in the roots of Fennel. 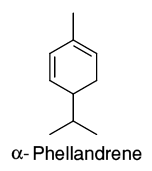 The characteristic parsley flavour and odour of crushed leaves is due to the presence of an unusual volatile monoterpene, 1,3,8-p-MenthaTriene . 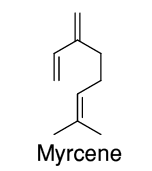 Other compounds present include β- Phellandrene , Myrcene, Apiole , Terpinolene (aka ), and 1-methyl-4-isopropylbenzene as major components. The Curly Moss variety of Parsley contains up to 85% of the poisonous Myristicin in its essential oil, the poisonous constituent of Nutmeg . 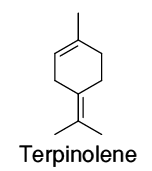 Terpinolene (aka δ-Terpinene) is another monoterpene, part of a group of four similar Terpinene isomers, α, β, γ and δ, which all occur naturally in some plant or other (apart from β-Terpinene). 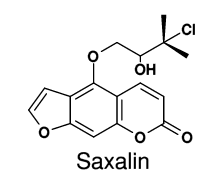 Saxalin is a chlorinated furocoumarin (based on Psoralen) which is contained in several plants of the Carrot Family especially Parsley . 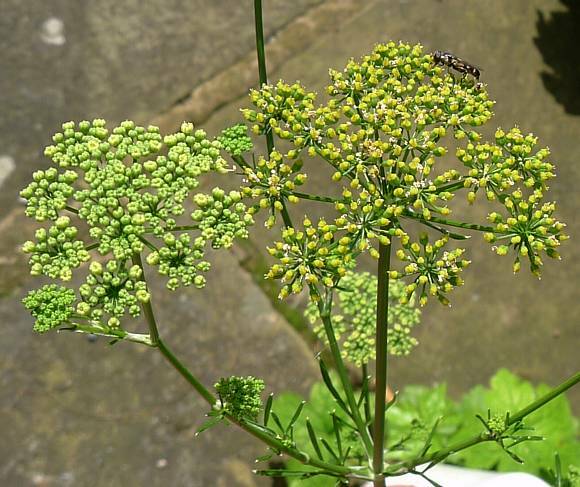 It was first discovered in the roots of Angelina saxatilis, and is also found in two species of Hogweed: Heracleum granatense and Heracleum pyrenaicum (but none of these are native to the UK). 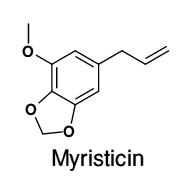 Other (non-chlorinated) furocoumarins, such as OxyPeucedanin , Bergapten, Xanthotoxin, IsoImperatorin , IsoPimpinellin, Marmesin and Heraclenol, and the Coumarin Graveolone have also been reported as major coumarins in some varieties of Parsley, but un-like Saxalin, none are chlorinated. 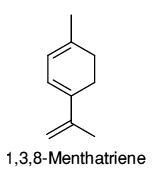 Marmesin (aka Nodakenetin) is a linear FuroCoumarin. 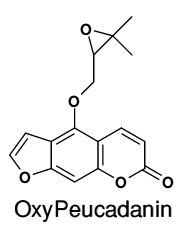 OxyPeucadanin looks very similar to Heraclenin until you realise that the long side-branch is on the opposite side (topside instead of bottomside in this depiction). The furocoumarins are responsible for dermatitis when the sap of the plant containing them is got on the skin and then that area of skin is subsequently exposed to the ultraviolet light in sunlight; they are photoactive compounds. Graveolone is an unusual coumarin (a PyranoCoumarin) which is also found in Dill (Anethum graveolens) and has a dimethyl- chromenene moiety rather than a furanone fused to the opposite end. Lacking the furanone moiety it is not a furocoumarine.